It is with great sadness that I report the death of my friend and co-author Derek Sutcliffe after a lengthy battle against Multiple-Sclerosis. I first met Derek at one of the BWISC Conventions about 20 years ago and we immediately developed a rapport, not just because of our mutual interest in all aspects of Jamaica but due to his friendliness and eagerness to share information with everyone. Derek rarely spoke about himself and I am grateful to his youngest son, Peter, and Michael Rego for providing me with earlier information. Derek was born in Cambridge in 1927. He went on to study at Cambridge, graduated in History from Clare College, then in Law, before accepting his first job as an articled clerk in Lincoln. In his spare time he helped his father write a number of books, and the ‘Stories From Science’ series they co-authored were standard texts in many schools, and were widely translated. Despite, or perhaps because of surgery, Derek always had his trademark limp and it often singled him out for special attention. But he never felt sorry for himself, he just saw it as an excuse for an easy life. In the Civil Defence in the 50s whilst his comrades exhausted themselves running in and out of burning buildings practising their trade, he always got to play the victim, the one strapped to the stretcher, being lowered from smoke filled windows, the one being rescued. In Lincoln he met his wife to be, Eugenie and shortly after their marriage, they moved to Huddersfield where he started work for Huddersfield Council. He held a number of positions, including court prosecutor, before he rose to become Chief Conveyancing Solicitor responsible for buying and selling all the council's land. Derek was a founder member of the ‘Roses Caribbean Philatelic Society’, based freely in the Yorkshire and Lancashire areas reflecting its main membership. The first meeting of what was to become the ‘Roses’ was held in a private home in Leeds on 13 July 1957, with Caribbean philatelic specialists from Wakefield, Bradford and Leeds. On the formation of the society Derek became the ‘Roses’ Chairman in 1970–71, President 1972–73, Treasurer 1984–85. “Away from work, dad had one great passion – stamps. Every Sunday night the stamp collectors of Huddersfield would gather round at our house. There must have been twenty of them crammed round one little table, every one of them smoking for Britain. And we'd be sent in with huge plates of sandwiches and we literally couldn't see where to put the plates for all the smoke. Dad always claimed it wasn't just a social club, that they were doing stamps (whatever that means). But every few minutes a huge roar of laughter would break out and practically shake the foundations of the house. And somehow, I don't think stamps were ever quite that funny”. In the 1980s Derek took early retirement and much to the family’s amazement he agreed to give up his comfortable life in Huddersfield, sell the family home and head off with his wife abroad. The year they spent in Spain and Portugal, living in a series of cheap guest houses and low dives, was a happy time for them. Upon his return to England, and with characteristic good fortune he found himself in the only cheap flat in London within spitting distance of the Royal Philatelic Society. He made the short journey there on a daily basis where he helped re-catalogue their library and was honoured with Fellowship of the Society. Meanwhile, Eugenie soaked up the culture touring the capital’s libraries, theatres and museums. Derek was never more happy than when meeting serious Jamaica collectors from all over the World, many of whom he had influenced with his articles, talks and letter writing. Tom Foster, Bob Swarbrick, Bob Topaz, to name but a few, would pay Derek a visit prior to them publishing major works. His wealth of knowledge and material was profound. In 1982 he had published through the Roses Society ‘The Military Mail of Jamaica’ upon which subject he was the acknowledged world expert, building up the definitive collection before and after. Derek was a prodigious cataloguer and over the last 15 years he had also been working with me on the Encyclopaedia of Jamaican Philately, of which three volumes have so far been published, with others in the pipeline. Derek’s disability progressed considerably in the last few years and he and his wife moved into a care home near Chelmsford. Paul Wright and I visited them regularly – sadly Eugenie died in January and Derek passed away soon after. His many friends will miss his generosity, helpfulness and above all perpetual cheerfulness; it is a great loss to philately, his friends and his family. Our sympathy is extended to Derek and Eugenie’s three sons, Nick, John and Peter and their families. It's hard to do justice to a life in a few simple words. Not least because everyone knows a slightly different person, sees different things in them, and I'm sure everyone will remember their own Derek, dad, grandad. He was born in Cambridge in 1927, the only child of Arthur and Faith. His father was a self-made man, who rose from humble beginnings to become a respected educationalist, a Trustee of the TSB, even Sheriff of Lincoln. But he was a strict man of the old school who seemed genuinely to believe the Victorian adage that children should be seen and not heard. When Derek was very young the family moved to Lincoln and his childhood was spent between there, Cambridge and Mythlmroyd in Yorkshire, where the family hailed from. Derek became Head Boy at the City School in Lincoln, where his father was also headmaster. Later he went on to study at Cambridge, graduated in History from Claire College, then in Law, before accepting his first job as an articled clerk in Lincoln. In his spare time he helped his father write a number of books, and the “Stories From Science” series they co-authored were standard texts in many schools, and were widely translated including, bizarrely, into Japanese. Despite, or perhaps because of surgery, dad always had his trademark limp and it often singled him out for special attention. But he never felt sorry for himself, he just saw it as an excuse for an easy life. In the Civil Defence in the 50's whilst his comrades exhausted themselves running in and out of burning buildings practising their trade, dad always got to play the victim, the one strapped to the stretcher, being lowered from smoke filled windows, the one being rescued. Life seemed good to Derek in Lincoln and we've heard stories of a number of girlfriends from those early bachelor days. And it was one such girl, Dorothy Pikett, who would remain a life long family friend, who not only introduced Derek to his future wife, she also foretold their union. Dorothy dabbled with tarot cards and one night Derek asked her to tell his fortune. And the cards said, so she claimed – you will meet a tall, blonde woman of foreign persuasion and you will marry her. Dad apparently was delighted at the prophesy, not least because pretty Eugenie Meyer from Latvia had just moved in 3 doors down the road. The rest, as they say, is history. Mum and dad came from very different worlds, and their tastes and interests were poles apart. Yet they found something in each other that lasted their lifetimes, something rare and precious, something called happiness. They were the original odd couple who had nothing in common except 50 years of wedded bliss. And they obviously couldn't wait to start a family for a mere 10 months after the wedding Nick was born. John followed soon after and much, much later I came along. You could never describe dad as a hands on kind of father, but we never doubted his affection and he was always a calm and benign presence. He sometimes liked to talk the stern Victorian values of his father, but he was fooling no-one - dad was a pussycat, with a kind heart. And, for a man who disliked music, and hated all, what he called, unnecessary noise, he was also strangely tolerant of the racket made by his three drum and guitar playing hoodlum sons. Shortly after their marriage, mum and dad had moved to Huddersfield and dad started work for Huddersfield Council. He held a number of positions, including court prosecutor, before he rose to become Chief Conveyancing Solicitor responsible for buying and selling all the council's land. Talking to Shirley Chambers, an ex-work colleague of dad's, she remembered a man who was always happy and cheerful with a lovely, easy manner – a pleasure to work with, she said. But away from work, dad had one great passion – stamps. And every Sunday night the stamp collectors of Huddersfield would gather round at our house. There must have been twenty of them crammed round one little table, every one of them smoking for Britain. And we'd be sent in with huge plates of sandwiches and we literally couldn't see where to put the plates for all the smoke. Dad always claimed it wasn't just a social club, that they were doing stamps (whatever that means). But every few minutes a huge roar of laughter would break out and practically shake the foundations of the house. And somehow, I don't think stamps were ever quite that funny. Stamp collecting, though, was so much more than just a hobby for dad. He loved it, worked hard at it all his life and became an expert in his field with an international reputation. Philately really was dad's life's work and we're all really grateful to dad's friend, Steve Jarvis, whose going to tell us a little bit more about that side of dad's life later on. Early retirement offered mum and dad a whole new lease of life, and much to everyone's amazement he agreed to sell the family home and head off with mum into the unknown, or worse still...abroad. It must have been some sacrifice for dad to give up his comfortable, solid life in Huddersfield, but the year they spent in Spain and Portugal, living in a series of cheap guest houses and low dives, was a happy time. And once there, true to form, dad enjoyed every minute of it. They met some interesting types on their travels and, in a scene reminiscent of an EM Forster novel, mum and dad held court in Mr Mende's little guest house in Lisbon surrounded by an exotic cast of real characters; young Marina, bright and vivacious from Goa, beautiful Teresa from Singapore, and Ron, the white bearded, Canadian sea dog and shark fisher extraordinaire with the scars to prove it. They all loved dad, loved his quirky sense of humour, his openness and his generosity. And then came the return to England, and with characteristic good fortune dad found himself in the only cheap flat in London within spitting distance of the Royal Philatelic Society. 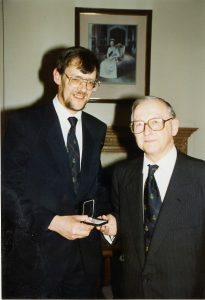 He made the short journey there on a daily basis where he helped the mother of all stamp clubs re-catalogue their library and was honoured with Fellowship of the society. There are so many things I could say about dad, stories I could tell. I could talk of his sweet tooth, his love of stem ginger, Old Jamaica chocolate and Cinzano Bianco – tall glass, slice of lemon, ice and lemonade. I could talk of how he was always early, often several hours early, for everything, how he over-tipped wildly, and how he gave the worst road directions of anyone I've ever known. At family gatherings he was always the quiet one. Whilst we all ran around like mad things, talking ten to the dozen, I can picture dad, amidst all the hullabaloo sitting in the comfiest armchair in the house, trashy war novel in one hand, Hamlet cigar in the other, uttering those immortal words “lash me a cinzano”. Dad was never the type to wear his heart on his sleeve, but as his Multiple Sclerosis progressed over the last 10 years or so, it caused him to be a little more detached. It made him seem more distant, a little less engaged with those around him. It seems like only yesterday that we were all here for mum's funeral and I suppose it's no surprise that dad has followed on so soon. After 50 years of marriage it seems almost like he made his decision. Like he knew where he wanted to be, and with whom. And now we can all remember our different Dereks, dads, grandads, but we know they all shared one thing in common, the simple decency of a good, generous and truly gentle man.